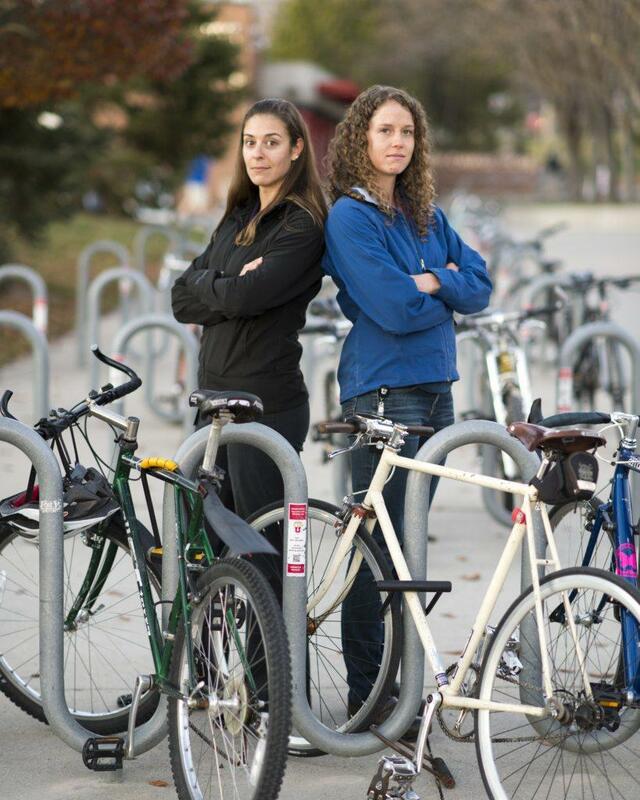 University of Utah graduate students Penny Atkins and Koren Roach are making an impact both in the lab and on their bikes. Atkins and Roach are bioengineering graduate students in the Department of Orthopedics at the U, but they are also working to give back to the community in their free time. In addition to time spent in the lab, Atkins and Roach help to coach a local high school mountain biking team. Neither ever expected to become a coach, but the pair received an offer they couldn’t pass up earlier last year. Roach is originally from New Hampshire and received a bachelor’s degree in biomedical engineering from Worcester Polytechnic Institute. Atkins grew up near the Rocky Mountains, went to Montana State and majored in industrial engineering. Both moved to Utah in 2013 to pursue doctorate degrees in bioengineering at the U. “I think one of the best things here is the ability to have such a good educational program and access to industry, as well as the access to the mountains,” Atkins said. Atkins and Roach work side-by-side in a laboratory on campus. Last year, Bo Foreman, a colleague of theirs, invited the two to be assistant coaches for the mountain biking team he oversaw. Foreman is the head coach of the South Davis Composite Mountain Biking Team. He knew Atkins and Roach would inspire some of the girls on the team, so he enlisted their help. South Davis Composite is one of the dozens of high school mountain biking teams that are a part of the Utah High School Mountain Biking League. Teams compete in five races each year held in locations throughout northern and southern Utah. Students in grades seven through 12 are welcome to join any of the teams in the league. The Utah High School Mountain Biking League is associated with the National Interscholastic Cycling Association, which encompasses 22 leagues in states across the country. Utah has the fastest growing league in the nation, meaning that teams are always in need of new coaches. When Atkins and Roach were asked by their lab director to help coach the South Davis Composite Team, they jumped at the opportunity. The two students already loved biking, so it was not a burden when they decided to join the team’s coaching staff in July. Before the students moved to Utah, neither had much cross-country mountain biking experience. Atkins had only done some downhill biking in Montana, and Roach had never mountain biked before. Shortly after beginning their doctoral programs at the U, Roach was introduced to the sport through a roommate who was an avid biker, and she was instantly hooked. Atkins and Roach met during their first year in the program while working in the same lab, and they have been riding together ever since. Prior to coaching, Atkins said she had already had other volunteer experience. This, however, was a unique opportunity. Roach said she was surprised by the lack of girls on the team when she started coaching. Both Roach and Atkins said they were glad to have been a part of the team. Before the students took on coaching responsibilities, they were immersed in their demanding bioengineering program at the U. In the orthopedic research lab they share, Atkins studies deformities impacting hip movement and Roach studies surgical treatment for osteoarthritis in the ankle. Their work utilizes a new technology called “dual fluoroscopy” which allows them to study the motion of joints with a three-dimensional x-ray. Using this technique gives them far more accurate results than normal motion capturing technologies, Roach said. Atkins and Roach spend a lot of time in the lab, so they have had to find ways to manage their busy schedules. Between the intense doctoral program and coaching, there is not a lot of extra time. It’s all about prioritizing what matters most, Atkins explained. “It’s easy to just keep on working, so it’s nice to have a time in my schedule that requires me to go biking,” Roach said. Both students will graduate in the upcoming year, but they hope to continue coaching. Even if they don’t stay in Utah, both say that they will seek out teams to coach in whatever state they move to, as the opportunity has been fulfilling and memorable. “Doing something good for the community, enhancing lives, and biking — what could be better?” Roach said.